Click on the appropriate symbol for emails, calendar, contacts, tasks or notes. Opens a dialog where the number of data records per request can be defined. 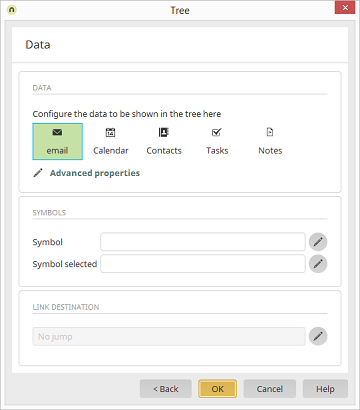 Displays the link to the imges used for the selected and unselected tree folders. Opens a dialog where the images can be selected. Displays the selected application and target page that is loaded when a user clicks on a folder in the tree. Opens a dialog where the target destination and target page options can be defined.